Fog, drizzle, showers, and thunderstorms are in the forecast for Monday and Tuesday, but Wednesday and Thursday look spectacularly sunny. This warm front will be the death of me. In weather-speak, a front is the boundary between two different air masses — in this case, it's the dividing line between "cool" and "warm". So, as that front set up on top of New Jersey on Saturday, we saw high temperatures near 50 degrees to the north and near 80 to the south. Another case proving that, while New Jersey is a small state, it isn't that small meteorologically! On Sunday, that warm front drifted south, so we were stuck on the cool and drizzly side. For Monday, the front swings well north of the Garden State. While we still maintain grey and dreary conditions in Monday's forecast, at least it will be warmer. For Monday morning, we'll see a mixed bag of fog and drizzle (mainly south and coast) and showers (mainly north). By Monday afternoon, it looks like the main forcing for steadier rainfall moves away from New Jersey. So I'll hesitantly say that this afternoon will be drier across the state. (Of course, I can't rule out a few stray showers.) Skies will remain mostly cloudy. But temperatures will soar to the upper 50s in North Jersey and upper 60s in South Jersey. I'll call Monday night mostly dry too. However, patchy dense fog is possible, if not likely. Temperatures will only fall to around the 50 degree mark overnight. Tuesday will be another "yucky" weather day. Fog and showers may persist throughout Tuesday morning. One more push of rain is expected Tuesday afternoon and evening, potentially in the form of thunderstorms. We stay warm for Tuesday, with highs ranging from near 60 (north and coast) to near 70 (south). I have to admit — this is turning into a very springlike pattern. By Wednesday morning, skies dry out and clear away to sunshine. Even though we'll have a stiff northerly breeze (up to about 20 mph), Wednesday looks like a beautiful day. High temperatures will end up in the seasonable upper 50s. Thursday looks good too, although a bit cooler. Highs will end up in the lower to (maybe) mid 50s, again with abundant sunshine. Another sizable storm system looms for the very end of the workweek. And it will carry a chance for prolonged rain. 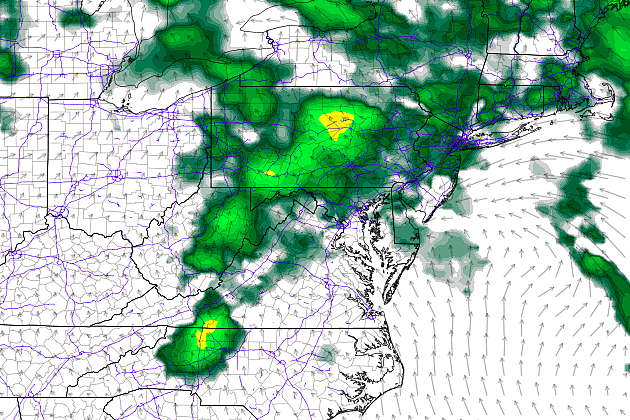 Friday may turn into a washout, with rainfall peaking around Friday late afternoon and evening. April begins on Saturday, and it looks like the wet weather continues for the start of the new month and the weekend. Hopefully we'll get some clearing by Saturday afternoon. For now, Sunday looks like the better day of the weekend.